Most people visiting Luxembourg spend their time only in the capital – Luxembourg City. Well, I have to admit there’s enough to do there, but if you want to discover the country – the Grand Duchy of Luxembourg – it’s easy as every place can be visited within a day trip from Luxembourg City. Luxembourg will surprise you with its lovely villages, beautiful medieval castles and stunning nature. Here are they – 6 of the most beautiful places to visit in Luxembourg on a day trip from Luxembourg City. Vianden is an adorable little town on the River Our in the Luxembourgish Ardennes. 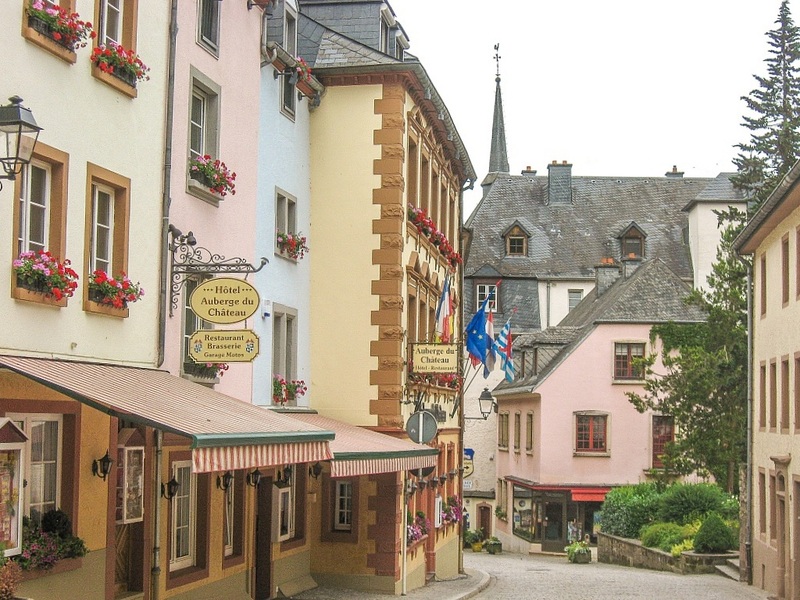 The town is a popular tourist destination in Luxembourg but just take a side step off the main street and you will find yourself walking into a different world: quiet cobbled streets, tranquility, blooming flowerpots everywhere, and you have the feeling as life has stopped. Vianden became a town in 1304 and in the 15th century it was already the 3rd biggest city in Luxembourg. From those glorious days there are left the remains of the old fortifications that once protected the town and its inhabitants from the enemies. Today, partly restored, the ramparts are a nice place for a walk. The Castle of Vianden is perhaps the most famous asset of this little place. Built between the 11th and 14th century and sold piece by piece in 1820 by the Dutch King William I, the Castle of Vianden was restored to its previous glory in the 1970s. You can reach the castle following the road from the town, but I strongly recommend taking the chairlift and then following the path to the castle. You won’t be disappointed – the views on Vianden, the castle and the valley of the Our River are simply breathtaking. Walnuts are the specialty of Vianden. So, when staying there, do not forget to fill in your supplies of anything walnut: walnut oil, walnut liqueur, walnut bread, sausages with walnuts… Vianden even has its own Walnut Festival, which is held each year in October. We stayed in Vianden on our 4-day trip around Luxembourg and we absolutely fell in love with the place, its castle and the surrounding beautiful nature. I don’t want to disappoint you, but the best way to reach Vianden from Luxembourg City is by car. In fact, it is easier to travel around in Luxembourg by car than by public transport. So, if you rely on the public transport in Luxembourg, take the train from the Central railway station in Luxembourg City to Ettelbruck. From Ettelbruck get bus line 570 direction Stolzembourg, Akescht and get off in Vianden. The journey is about an hour. Check out all options on the website of the Luxembourg Railways. Echternach lies in the Müllerthal in a bend of the Sûre River and is the oldest town in Luxembourg. The town was formed around the Benedictine Abbey founded by the English monk St Willibrord in 698 AD. The place obtained township rights in 1236. The Abbey, as we know it today, comes from the 18th century when the original one was rebuilt in Baroque style. The best way to discover the town is by foot. Start from the beautiful Abbey with the lovely park and the Basilica of St Willibrord, and head to the Market Square lined up with lovely colourful buildings. Don’t forget to look up so that you don’t miss the beautiful shop signs made of wrought iron. The Market Square (Place du Marche) is dominated by the Dënzelt – the former palace of justice. Some parts of the building date back to the first half of the 14th century. The façade however is an eclectic mixture of Gothic and Renaissance influences. Echternach is also famous for the Whit Tuesday dancing procession. Each year the event attracts about 13 000 participants. Because of its significance it has been added to the UNESCO’s Representative List of the Intangible Cultural Heritage of Humanity. Echternach is easy to reach by public transport from Luxembourg City. Bus lines 111 and 110 go from Luxembourg City to Echternach and it takes about 40 minutes. Clervaux is a lovely little place in the Luxembourgish Ardennes, located in a bend of the Clerve River. It has an absolutely picturesque setting, which can be best admired if you approach the town by car. When you start descending a mountain ridge, following a few hairpin turns you will be smitten by the view to this small town, dominated by the white castle and the Church of St Cosma and Damian. A bit further, up the hill is located the Benedictine Abbey of St. Maurice and St. Maur. The Abbey was built at the beginning of the 20th century and is still functioning as such. The hidden treasure of Clervaux is the photographic exhibition The Family of Men hosted in the Castle of Clervaux. I was literally mind blown and I can’t enough recommend it. The collection consists of 503 pictures by 273 photographers from 68 countries. The exhibition was initially curated by Edward Steichen for MoMA in New York. After it travelled the world in the 50-s and the 60-s, it found its final home in the castle in 1994 as was the wish of the former MoMa director Steichen who was actually born in Luxembourg. Since 2003 the exhibition is included into the UNESCO’s Memory of the World Register. There is a direct train from Luxembourg City to Clervaux. The journey takes about an hour. The name of Schengen affects us in our daily lives, not only if live in Europe but also if we travel to and around in Europe. Most people have heard about the Schengen Area and quite a lot of travellers need a Schengen Visa, but almost nobody can point on the map where Schengen is located. Well, it’s easy, just look for the southeastern tip of Luxembourg where the borders of Luxembourg, France and Germany come together and there at the tripoint you have Schengen. The Schengen Agreement (1985) that grants free movement of people, was actually signed on the board of the passenger MS Princess Marie-Astrid ship on the Moselle River near the town of Schengen. Today we can’t imagine anymore travelling in a Europe with borders and border checks. When in Schengen, visit the Monument of Europe and the European Museum, which commemorate this significant episode of Europe’s history. For the rest, Schengen is a sleepy little town on the Moselle River set among vineyards and orchards. Do not miss to try the local wines when there. When we were in Luxembourg we couldn’t visit Schengen, but we will return to this gorgeous part of Luxembourg – the Moselle Region to enjoy the beautiful scenery with vineyards. Bus line 315 from Luxembourg City goes directly to Schengen. It takes about 40-45 minutes. There’re also other options with changing buses at Remich or Mondorf. While the castle of Useldange is not officially one of the seven castles in the Guttland region in Luxembourg, it’s worth a day trip from Luxembourg City. The small town of Useldange (it’s really, really small with only 600 inhabitants) lies on the Attert River. The medieval castle, or at least the ruins of which, stands proudly on a small hill in the centre of the town. The castle was built in the 12th century and after years of prosperity was sold two times which led to its decline in the 17th century when the castle ended up in ruins. At the beginning of the 20th century the castle was bought by a private person and the restauration got in the wrong direction. Today, the reconstruction of the castle continues true to the medieval look and feel of the place. From the top of the tower there is an amazing view and if you happen to be in Useldange in June, do not miss the medieval fair that is organized annually. There is one direct bus line from Luxembourg City to Useldange – bus 445. There are also a few options with changing buses. The trip takes about an hour. Although Esch-sur-Sûre is very tiny (about 300 inhabitants), it deserves to be listed among the most amazing day trips from Luxembourg City. The Sauer River (Sûre in French) makes a 360 degree bend thus creating almost a perfect island connected to the ‘mainland’ by an 80-m wide isthmus. In the middle of the ‘island’ clung onto the rocks stands the town of Esch-sur-Sûre dominated by the fairytale ruins of a medieval castle and its tower. The castle of Esch-sur-Sûre is perhaps the oldest castle in Luxembourg with some parts dating back to 927 AD. The castle had a turbulent history changing owners after each war. In the 17th century the castle fell into the hands of the common folk and until the 19th century there were still families living there. Little has changed in this medieval town over the centuries which makes it a lovely place for a day trip. You can also visit the dam (built in 1956) on the Sauer River which forms the Upper Sûre Lake or hike one of the many trails in the Upper Sûre Nature Park. Take the train form Luxembourg City to Ettelbruck and then bus 535 to Esch-sur-Sûre. It takes about hour and a half in total. Planning to visit Luxembourg, pin this article for later! Note: All photos above are copyright of ipanematravels.com unless otherwise indicated. LFT stands for Luxembourg for Tourism. From the 6 places listed above I have visited 3 during my 4-day stay in Luxembourg. I hope one day I will return to Luxembourg and will visit the other 3. I know it’s gonna be difficult again to choose where to go and which place to skip, so many hidden gems are there in Luxembourg! Which is your favourite day trip in Luxembourg? Share with me in the comments below!